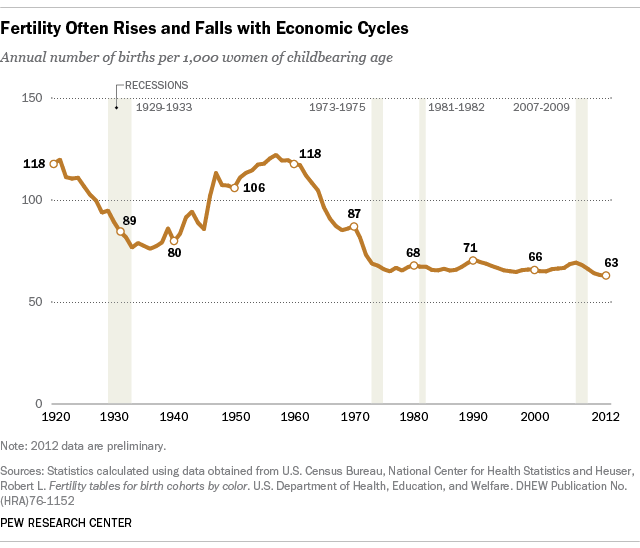 U.S. births are in the news again, with the release today of 2012 statistics indicating a flattening of the sharp decline in fertility that accompanied the Great Recession. The number of U.S. births in 2012 was not statistically different from 2011, and the birth rate barely declined, according to the National Center for Health Statistics. Here are the preliminary numbers: There were 3,952,937 babies born in the U.S., no different statistically from the 3,953,590 born the year before. The fertility rate was 63.0 births per 1,000 women of childbearing age, only slightly lower than 63.2 in 2011, which itself had been the lowest on record. The U.S. birth rate, which had been relatively stable or rising, began falling after 2007, when the Great Recession began and the decline persisted even after the official end of the recession in 2009. But the pace of decline showed signs of slowing in 2011, when the birth rate dipped by a relatively modest 1.4% from the year before. By contrast, from 2009 to 2010, it declined by 3.2%. The recent decline in births was led by foreign-born women, especially those from Mexico, according to a previous Pew Research analysis. The decrease in fertility was particularly steep among women with a high school diploma or less, as well as younger women. The drop was largest in states hardest hit by the recession, another Pew Research report showed. Birth rates have often declined during hard times, only to recover somewhat when the economy improves, as this week’s chart shows. In recent decades, economy-related fertility decreases have been overshadowed by long-term declines in births that researchers have linked to improved birth control, women’s rising education and employment, and other factors.